There is abundant parking surrounding e3 Civic High. Please see below. -Parking is $1.25 for each portion of 20 minutes after the first 2 hours. 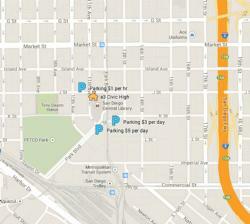 -Enter parking from 11th Avenue via Park Blvd. or K Street. There is also on-street parking available. 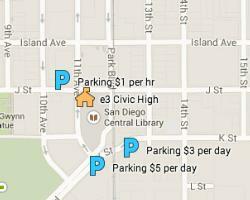 Bus and Trolley routes will get you to the Central Library and е3 Civic High from almost anywhere in San Diego. 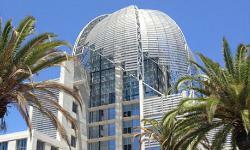 The Central Library and school are located midway between 12th & Imperial Transit Center to the south and Park & Market Trolley Station to the north. All three Trolley lines (Blue, Green, and Orange Lines) serve one or both of these stations. In addition, there are more than 18 bus routes which stop within a few blocks of e3 Civic High. North County travelers can take an Amtrak or COASTER train to Santa Fe Depot and transfer to either an Orange Line or a southbound Green Line Trolley.